Wiley Wiggins as Martin Beuscher and Patrick Riester as Peter Bishton in COMPUTER CHESS, a film by Andrew Bujalski.Credit: Kino Lorber, Inc. Winner of the Alfred P. Sloan Feature Film Prize (awarded to films dealing with science or technology) at the 2013 Sundance Film Festival, Computer Chess is a dryly funny film about programmers participating in a computer chess tournament three decades ago. Shot in black and white with a video tube-camera, Computer Chess is an inventive, clever piece of filmmaking that will not be to everyone's taste, but will surely reward those up for it. The film is a comment on our relationship with technology. We, as a society, strive to create technology that surpasses our intellect. 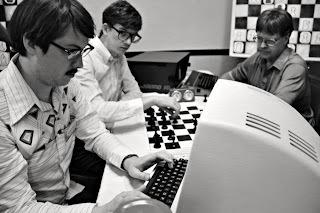 In Computer Chess, the characters are trying to create a computer program that can beat a human at chess. The film shows how our want to create smarter computers sprung from a concept as simple as this. We continue to make smarter computers. When will we create something so smart that it can outsmart us? Computer Chess also serves as a comment on the state of the world today. The programmers in the film spend all of their days at the competition programming. Everything is limited, yet limitless. The physical space, activity variety, and human interactions are limited, but there is no limit to what the programmers can do with their computers. Not much has changed from then to now. Physical space has been shrunk now and intellectual space has expanded. Writer/director Andrew Bujalski shows us the start of the technological revolution with the simple story of programmers trying to make a better computer chess program. The film has a very dry sense of humor that is bizarre and clever. Its use of surreal imagery also adds to the humor. Sometimes the surrealism and dryness is taken farther than it should be, making the movie a little too confounding, but it is nice to see something this different and original. Each character is distinct and amusing, but they are all lifeless, another comment on the programmers and society as a whole. By trying to put so much life into the lifeless computer, the programmers lose some of their own spark. Real human interactions are painful for them. Their life is in their computer. This is ironic because that life is being poured into making a better mathematical equation, something that is artificial and limited. Overall, Computer Chess is an original, clever film that is worth seeing, even if it gets too weird for its own good. If there's one thing I can say, you'll have never seen anything like it.